This is a reupload from 2007. The Military AI Works 1st Anniversary Airshow Package was produced to recognize and celebrate the first Anniversary of the Military AI Works and to provide a unique bonus AI package to all its staff, contributors and loyal customers to whom so much is owed for the success of MAIW. "MAIW Field" on the Bahamas has been significantly modified to provide drive through parking on both the west and east parking ramps for the 42 participating AI aircraft, parking for the 39 static display aircraft on the west parking ramp, an amusement park for the kids, refreshment stands, a small hot air balloon festival, VIP tents for flyby viewing, grandstands for flyby viewing and an entertaining venue for the presentation of the Military AI Works 1st Anniversary Airshow. 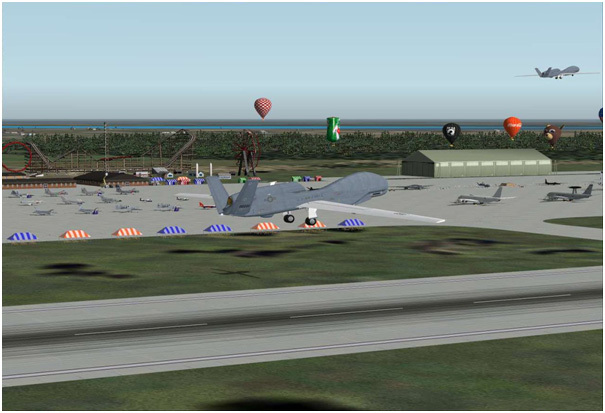 This package utilizes AI aircraft from the following previously released AI Package by Mike MacIntyre and 16 AI Packages by MAIW. Please read the readme carefully after unzipping for full instructions or this package won't work properly!